MONTREAT, N.C. — When we see the world through the eyes of love, compassion and mercy — the way the Good Samaritan did — it’s like giving God a divine shout-out and a high five. “We need more people with the courage to see, who will take off the blinders of simply minding our own business,” the Rev. 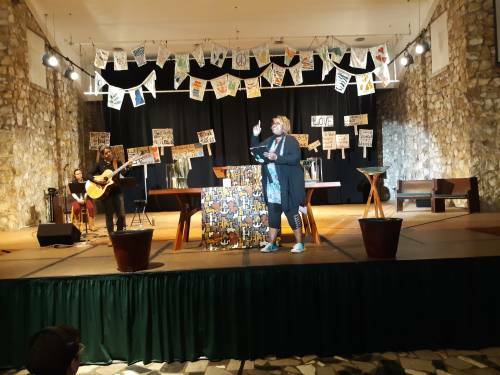 Aisha Brooks-Lytle, executive presbyter of the Presbytery of Greater Atlanta, told the nearly 1,000 students gathered Wednesday evening for opening worship at the 2019 College Conference at Montreat. The aim of the conference is to respond to God’s call for compassion in a broken world. In Jesus’ parable, the Good Samaritan saw the robbery victim “as a stranger, but thought of him as a friend, someone he could care for the way God had cared for him,” Brooks-Lytle said. He then took money out of his own pocket and told the innkeeper, “You have to care for him the same way I did,” she said. Peel back the layers. Brooks-Lytle is a 44-year-old widow whose husband died about nine months ago. She recalled having to sit in silence for two hours at a spiritual retreat a few years back. “God, I hate this,” she told the Almighty. “I hate that he is sick and is going to die.” It was then, she said, that she heard God’s voice: “Don’t hate it,” God told her. “See it, for the beauty and the brokenness.” Peeling back the layers, including in her difficult role as caregiver, brought about “so much healing, beauty and wholeness, even in those last moments” of his earthly life, she said. The conference runs through Saturday. It’s attracted students from more than 100 churches and campus ministries from across the nation.